Milk Glass is one of those types of glass that either people love or hate. There doesn’t seem to be much of a middle ground. It is the animals that everyone does like regardless of the type of glass. The late 1800’s brought an extreme interest from the public in milk glass. Several different glass companies were producing milk glass at this time. They include Atterbury, Challinor & Taylor, McKee and Westmoreland Specialty. In addition Vallerysthal and Portieux from France produced a large amount of milk glass that found its way into the United States. Even the people that don’t like milk glass are attracted to the different types of covered animal dishes. Many of the early animal dishes were actually used to pack some type of food in. Food packed in these dishes was horseradish, catsup, baking powder, mustard and others. In the 1890s, McKee produced fifteen covered animal dishes that were known as packer containers because they were made to hold food products. The animals were a hen, two headed chick, rooster, swan, horse, dove, turkey, frog, lion, squirrel, elephant, bunny, lamb, bird, duck and dog. These cheaply made milk glass containers were snubbed by collectors for a long time. Most of these animal dishes are now extremely hard to find because they were just food containers that were easily broken and thrown away. Now collectors are paying high prices for these containers. These early pieces were marked on the base with a signed McKee in script writing. The early bases were all ribbed. The Atterbury Company was looked upon as the finest producer of milk glass. They operated from 1860 to 1903. 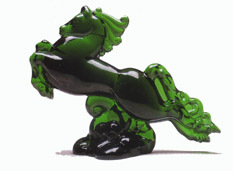 All their early pieces were marked with a patent date and the animals all had glass eyes that were glued in. Many of the animal dishes had lacy edge bases. Extra detail was given to all their molds to create realistic looking animals. The most popular animals included a hen, cat, fox, duck and fish. They also made many non animal dishes that collectors are on the search for such as the hand dish, maple sugar bowls, whiskey bottles and other table pieces. All their pieces are highly sought after by collectors. Challinor and Taylor produced milk glass from 1864 to 1891 and it rivaled that of Atterbury. The detail on their molds was also exquisite. For years Challinor and Taylor pieces had been attributed to Atterbury. Their most famous set of animals was the Farm Yard Collection. The set included included a rooster, hen, swan, duck, fish and oddly enough an eagle. Why an eagle was included is a mystery. Unless, maybe back when these animals were made, the eagles were commonly viewed flying around farms that it was thought they should be included. What a change since eagles today are rarely seen flying over a farm. The mother eagle is extremely hard to find. These animals were available on a basket weave base or a wavy base. Like McKee, early Westmoreland Specialty pieces were packed with food products. Unfortunately for today’s collector, since these were made just food containers and made for a food company they were not listed originally listed in Westmoreland’s catalogs. 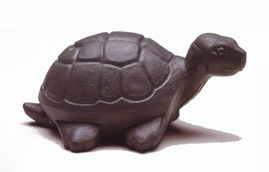 When Atterbury and Challinor & Taylor closed, Westmoreland was wise enough to purchase some of their popular animal molds. But the problem came in with telling the original and now Westmoreland pieces apart. They marked some pieces in 1910 with the Specialty mark and then later with a W superimposed over the G. Many of the animals were also put on the lacy edge base which Westmoreland called the Dancing Sailors. If you look real close you can see what looks like a sailor. Their popular animals were the hen, rooster, bunny, cat and chick. It is interesting to note that the hen first produced in 1889 continued in production until the company closed in 1985. The hen proved to be a best seller for almost hundred years. Many collections also invariably include animal dishes from Vallerysthal or Portieux. Some of their molds were acquired from the mold shop in Pittsburgh that also supplied some of the American firms. So even though their pieces resemble the American dishes, their milk glass formula was quite different. The French milk glass has a slightly gray tinge to it and is not as dense as the American glass. Some of the pieces are marked or bear a PV France sticker. A few of their popular animals include a swimming duck, turtle and a hen. Most milk glass covered animal dish collections include pieces from all the companies. The collector is always searching for that animal they don’t have. Many of the covered animal dishes have been now reproduced. Some of them have had the original mark removed and have been re-marked but many others haven’t. Like any collectible, study up on your particular category and learn how to tell the old one from the one being reproduced. Buy all reference books that apply to your collection and belong to an organization that can help answer your questions. The new animals can belong in a collection as long as you know what it is and have paid the correct price for it.